Crystal Borax Hearts Valentine’s Day Craft for kids – make your own Crystal Borax Hearts. Perfect for teachers for Valentine’s Day fun or for parents to implement on cold, snowy February days! This craft has been provided by Oakland County Crafters. If you are on the hunt for an inexpensive Valentine’s Day craft sure to wow the entire family of both young and old, you’ve found it. 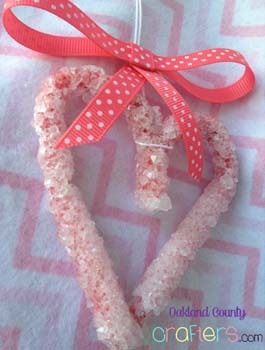 You can make Crystal Borax Valentine’s Day hearts with simple house hold items you most likely already have stored away in a cupboard. Here’s how. Before you begin, fill a pot with water and begin boiling it. While the water is boiling begin shaping your pipe cleaners into heart shapes. Remember your shapes must fit into your jar without touching the sides. Once your water has been boiling for a few minutes pour it into your jars and add your Borax. (About 3 tablespoons per 1 cup). Be sure to stir until completely dissolved. Attach each heart shape to a Popsicle stick using your yarn or string. Submerge your hearts into your jar of boiling water and allow the Popsicle stick to rest along your jar lid. Allow your hearts to set overnight. The next morning you will be able to see your hearts have become crystalized. Remove them from the water and allow them to dry out. Once your hearts are dry, replace their string and add a fun ribbon! 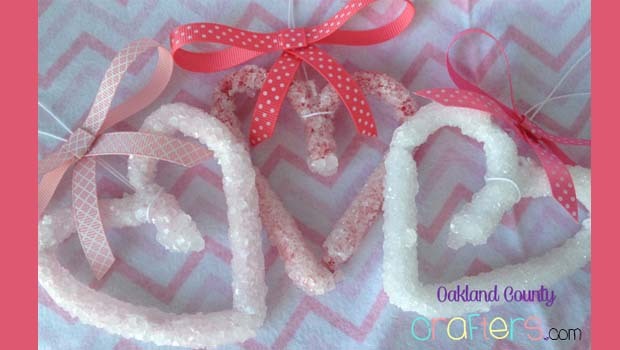 Crystal Borax Hearts Valentine’s Day Craft article submitted to Oakland County Moms by Samantha Bronsing of Oakland County Crafters. For more great ideas and Valentine’s Day crafts for kids.